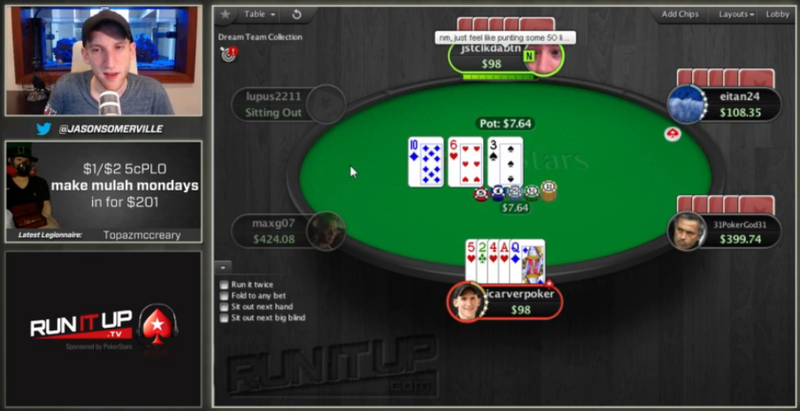 Online poker pro Jason Somerville is a very busy—and very popular—man these days. Last week, the 28 year old signed yet another sponsorship deal with one of the largest Daily Fantasy Sports (DFS) sites in the world, DraftKings. That brings his current sponsorships to three, including his Twitch Poker webcasting contract and PokerStars Pro status. Somerville fist gained universal recognition after Ultimate Poker went live in Nevada, becoming the first regulated online poker site in the US. Jason was a key ambassador for that brand, helping to build awareness and player retention by hosting a regular web show called Run It UP. Ultimate Poker eventually dropped the young poker pro in September of 2014, just two months before closing its virtual doors forever. But his time at UP, and his RIU web show, made him extremely popular among the online poker community. That opened the floodgates for other operators to pick him up, and PokerStars wasted no time in knocking on Somerville’s door. Since then, he’s taken his Run It Up episodes to the live streaming channel known as Twitch.tv. His moniker, “jcarverpoker”, quickly wrangled up a mass of over 100,000 followers, inciting another sponsorship deal to promote Twitch Poker. Now, young Jason has inked a contract with DraftKings to promote the DFS wagering giant on his RUI webcasts. As part of the deal, DraftKings will be hosting a series of online satellite competitions leading into a special Run It Up Reno poker series slated for October. Taking place at the Peppermill Casino, the 6-day event will include a number of $125 buy-in tournaments, followed by a $565 RIU Reno Main Event. Projecting a field of at least 500, Jason Somerville will also be on hand, of course, hosting poker seminars along with “surprise celebrity guests”. In an exclusive interview with LegalSportsReport, Somerville said that he’s not a big DFS bettor and only signed up an account with DraftKings a few months ago. Thus he was very hesitant to sign the deal, fearing the incorporation of DraftKings into RIU wouldn’t “be authentic”. However, Jason was eventually swayed by the operator’s recent affiliation with UFC. As a longtime fan of UFC who frequently vocalizes that fact on RIU, he felt he would have no problem bridging the gap between his online poker livestream webcast and DFS sports betting. The poker pro admitted that the majority of his viewers have probably never dealt in daily fantasy sports, but that he believes some of his fans will be intrigued by the possibilities, just as he was when he joined DraftKings earlier this year. Somerville predicted that “a pretty decent amount” of his viewers would try it out, despite the majority of Twitch viewers not being sports fans, per say. When you consider that a whopping 1.4 million Americans tuned in to watch his most recent livestream, even a minuscule percentage of that would be an impressive turnover for the DFS site. Interestingly enough, while DraftKings and FanDuel battle it out for the position of #1 DFS site in North America, the 3rd place position (sitting upon a rung of the ladder far below the top two rivals) is Victiv, which just happens to be owned by Jason’s other sponsorship partner, PokerStars. Despite promoting a rival brand, there should be no conflict of interest between his ambassadorships with PokerStars and DraftKings. DFS and online poker are very far apart in terms of skillsets. And besides, realistically speaking, being one of the world’s largest online gambling companies, Somerville’s promotion of DFS could feasibly draw players to the PokerStars-owned DFS site as well.